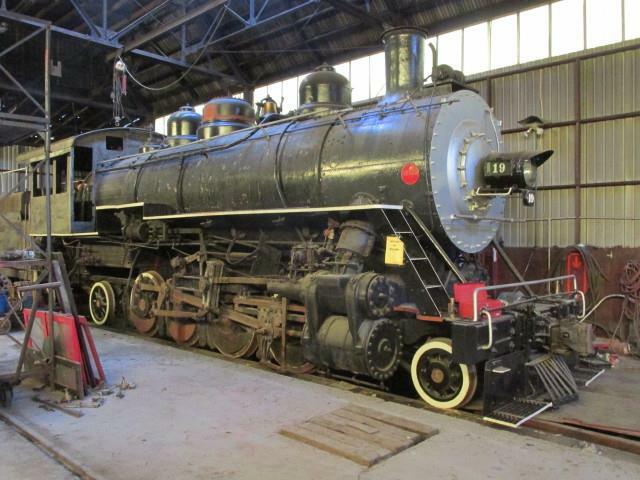 October 6, 2016 – The Age of Steam Roundhouse is pleased to announce the purchase of Yreka Western Railroad steam locomotive No. 19. No. 19, a 2-8-2 Mikado type locomotive, was built by the Baldwin Locomotive Works in 1915. After passing through a number of different owners – including the McCloud River Railroad and the Oregon, Pacific and Eastern – No. 19 last operated on the Yreka Western in 2008 before entering storage in Yreka, California. The engine gained considerable notoriety by co-starring with Lee Marvin and Ernest Borgnine in the 1973 film Emperor of the North. Crew members will begin work immediately to prepare No. 19 for shipment from California to the Age of Steam Roundhouse facility in Sugarcreek, Ohio. AoSRH intends to move No. 19’s tender and other components to Sugarcreek on a low-boy truck, while the engine itself will arrive in Ohio via railroad flatcar. Thank you for your continued interest in the Age of Steam Roundhouse, and look out for No. 19 as she treks across the country to her new home.